I was recently talking (okay, emailing. Okay facebook mailing) with a cousin of mine, when I admitted to eating fig jam spread on bread for dinner. She asked if I would be willing to admit it on my blog, and I said of course. So here it is: I don't cook everyday. I really don't cook dinner everyday. Sometimes, in fact, I make one dish and stretch it into several meals, either eating it all day for every meal or several days in a row. Heat a large saucepan over medium-high heat, and preheat the oil. Add the shallots and cook for about 5 minutes, until tender. Add the grains and stir to coat everything with the oil and shallots. Add the water and the stock and bring to a boil. Reduce the heat to low, cover and let cook until all of the liquid has been absorbed by the grains, about 40 minutes. You'll want to check it near the end to be sure the pot hasn't dried out and burned on the bottom. Off the heat, stir in the dried fruit and let cool to room temperature. In the meantime, whisk together the oil, the sage, and the vinegar in a small bowl (you can add as much vinegar as you want, to taste). Pour over the cooled salad and toss. Season well with salt and pepper, then fold in the pecans. They say the salad is best served at room temp, but I eat it straight from the fridge myself. 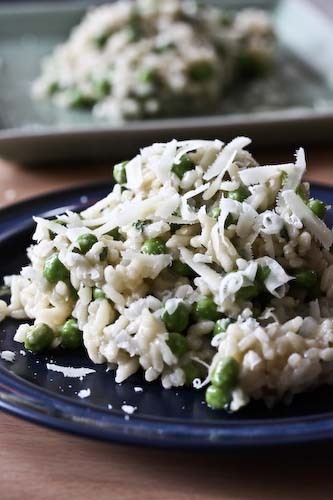 This 3 grain salad sounds amazingly healthy and delicious! Great way to use up dried fruit. lol, I only cook on weekends so my dinners are similar to yours. 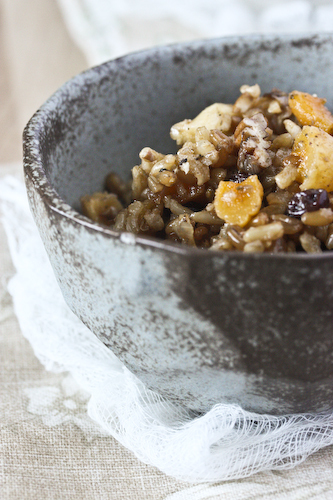 Love this salad and it's a great way to use up some leftover dried fruit. I like the definition of feasting. 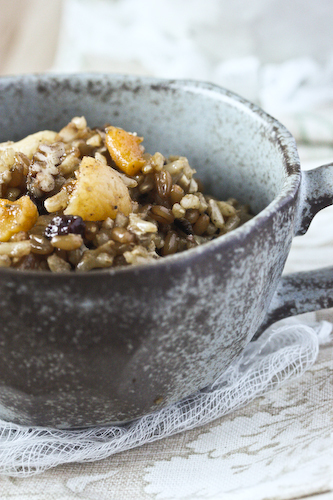 The mixed grains w/dried fruit sounds delish! Thanks for the link and mention! Beautiful post! And the recipe sounds simply delicious. There is a similar salad with wheat berries, apples and cherries that I get at a local natural food store. This looks just as amazing! It is my opinion, that the act of feasting does not occur in a vacuum. It is reliant on tempered bonvivance, convivance and in the skill that one's host meets their guests' comfort. It truly doesn't take much at all. I really like the way Bayless generally ends a large number of his episodes by cooking for a small group of friends who always seem to be arriving soon. Bayless' anthropological lense towards everything....ROCKS! JerryNJ, I've missed you! Where have you been? I’m charmed by your robust herald. I do drop by periodically but, regrettably have not contributed around here more often. For months now, I honestly feel as if I slay dragons and do the work of ten to fifteen men on a daily basis. My own blog has become oh so dormant in the way that other things have done so as well. All is good, well, happy, dandy and fine as I hope for you also. I’m waaay curious about something, however. In your most recent blog entry, I cannot help but to interpret that perhaps you’ve revealed something in a subconscious and Freudian manner. Will your blog soon undertake a new thematic undercurrent? Surely, the fab footwear you describe can be worn around NYC longer than two months out of the year......don’t cha’ think, yo?